Molly House Records is the latest expansion of Bay Area nightlife curators Kelly Lovemonster and David Richardson. After four plus years of cultivating queer culture thru their events Swagger Like Us, they are ready to bring their club experience directly to your earbuds. Swagger Like Us has become an institution for Bay Area residents. The vibe of the parties themselves feel like family, high energy and refreshing- however the esthetic is fashion forward, sleek and cool, and on the pulse with underground queer club circles, reflected in their guest talent, resident DJs, and hosts. Swagger Like Us has always been more than just a party, which is why the label felt like such a natural progression for the entrepreneurs. “Molly House not only gives us the chance to uplift queer talent beyond a single event, but we can begin to offer followers the chance to experience new music beyond the scope of the club, both literally and stylistically speaking. 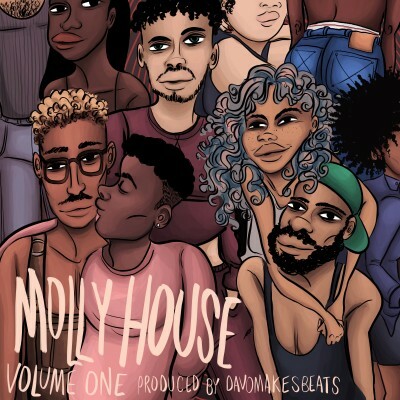 Molly House Volume 1 features the production work of davOmakesbeats, the resident DJ/ co-owner of Swagger Like Us, and member of the late electro-hop duo Double Duchess. The EP is chocked full of club samples and vintage analog keyboard sounds, while including a wide range of emotional expression. The compilation features artists Saturn Rising, AH-MER-AH-SU, and Bbymutha, who are all slated to release music with Molly House Records in 2017. Baltimore favorites TT the Artist and DDM are also included, as well as Futurehood’s shining stars Mister Wallace and Kaycee Ortiz.